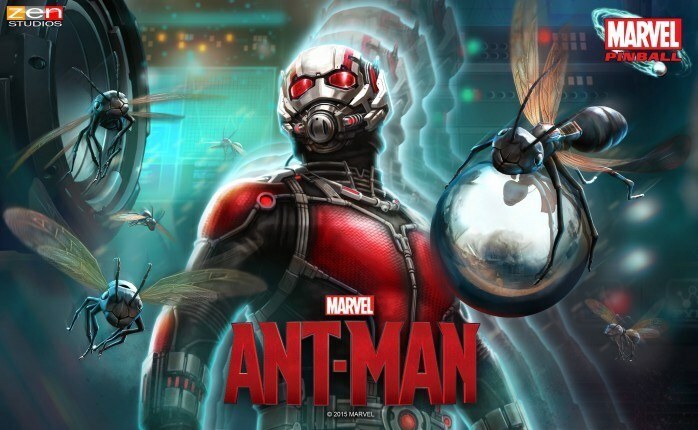 The newest addition to the Pinball FX2 stable of tables, Marvel’s Ant-Man, is now available! As we mentioned when the table was announced, Zen is doing some pretty interesting stuff with this one, including (as thematically appropriate) shrinking the ball! Armed with the astonishing ability to shrink in scale but increase in strength, master thief Scott Lang must embrace his inner hero and help his mentor, Dr. Hank Pym, protect the secret behind his spectacular Ant-Man suit. Against seemingly insurmountable obstacles, Pym and Lang must plan and pull off a heist that will save the world. There’s a giant Particle Ball in the middle of the table. Shrink it to free it from its cage! An underground mini-playfield with rotatable slingshots. Get the pinball down there to shrink Ant-Man and keep him tiny for as long as possible! Lock balls in Ant-Man’s helmet to speak to his ant associates and ride the winged carpenter ant, Ant-Thony, during Ants Multiball! Lock balls in Yellowjacket’s containment pod to start a multiball fight with him! Duke it out with the shrunken Ant-Man and help Hope Van Dyne train him with paintballs! ← Now Available – So Many Me!